Season one (Book One: Water) of Avatar: The Last Airbender, an American animated television series produced by Nickelodeon Studios, aired 20 episodes from February 21, 2005 to December 2, 2005. The series was created by Michael Dante DiMartino and Bryan Konietzko, and starred Zach Tyler Eisen, Mae Whitman, Jack DeSena, Dante Basco, Dee Bradley Baker, Mako Iwamatsu and Jason Isaacs as the main character voices. The season revolves around the protagonist Aang and his friends Katara and Sokka going on a journey to the North Pole to find a Waterbending master to teach Aang and Katara. The Fire Nation is waging a seemingly endless war against the Earth Kingdom and the Water Tribes, following the long-ago disappearance of the Air Nomads. Aang, the current Avatar, must master the four elements (Air, Water, Earth, and Fire) to end the war. Along the way, Aang and his friends are chased by various pursuers: banished Fire Nation Prince Zuko, along with his uncle and former general Iroh, and Admiral Zhao of the Fire Navy. Each episode of Season One attracted more than a million viewers on its first airing. Season One won "Best TV Series" and "Best Animated Television Series" in the boys 9- to 14-year-old demographic at the 2005 Pulcinella Awards, which gives awards for excellence in animation. Between January 31, 2006 and September 19, 2006, five DVD sets were released in the United States, each containing four episodes from the season. On September 12, 2006, Nickelodeon also released the "Complete Book 1 Collection Box Set", which contained all of the episodes in the season as well as a special features disc. The original releases were encoded in Region 1, a DVD type that plays only in North American DVD players. From 2007 to 2009, Nickelodeon released Region 2 DVDs, which can play in Europe. The first book has been adapted into a live-action film, The Last Airbender, directed by M. Night Shyamalan and released in 2010. The show was produced by and aired on Nickelodeon, which is owned by Viacom. The show's executive producers were co-creators Michael Dante DiMartino and Bryan Konietzko, who worked alongside episode director and co-producer Aaron Ehasz. Eight episodes were directed by Dave Filoni. Animation directors Lauren MacMullan and Giancarlo Volpe directed five episodes each, and Anthony Lioi directed two. Episodes were written or co-written by a team of writers, which included Nick Malis, John O'Bryan, Matthew Hubbard, James Eagan, Ian Wilcox, Tim Hedrick and Elizabeth Welch Ehasz. All of the show's music was composed by "The Track Team", which consists of Jeremy Zuckerman and Benjamin Wynn, who were known to the producers because Zuckerman was Konietzko's roommate. Two alternating Korean studios were enlisted to provide animation production support for the series, DR Movie and JM Animation Co. Most of the show's main characters made their debut within most, if not all, of the first episodes: Zach Tyler Eisen provided Aang's voice, Mae Whitman as Katara's voice, Jack DeSena as Sokka's voice, Dante Basco as Zuko's voice, Mako as Iroh's voice, and Dee Bradley Baker as the voices of both Appa and Momo. Additional supporting characters include Admiral Zhao voiced by Jason Isaacs, and Jet voiced by Crawford Wilson. 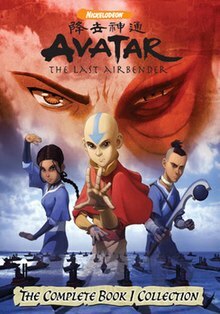 Film critics appreciated the first season of Avatar: The Last Airbender because it attracted the attention of "an audience beyond the children's market with crisp animation and layered storytelling." As for the video and picture quality, Gord Lacey from TVShowsOnDVD.com claims "the colors are bright, and the picture is nearly flawless." He says later in the review that "the audio is very nice, with lots of directional effects and nice musical cues." Barnes & Noble reviewer Christina Urban praised the season's masterful combination of "elements from Chinese kung fu, Tibetan philosophy, Japanese martial arts forms, and even Hindu spiritual beliefs". According to Aaron Bynum from AnimationInsider.net, "the series posted double digit year-to-year gains in May". He also said that the show has been number one in the boys 9- to 14-year-old demographic, and has attracted many age and gender groups in its pool of 1.1 million viewers who watch each new episode. In addition, the season has won many awards throughout its runtime. During the 33rd Annual Annie Awards, the show was nominated for the "Best Animated Television Production" award. Because of the episode "The Fortuneteller", the show was nominated for the "Writing for an Animated Television Production" award. For the episode "The Deserter", the season was nominated for and won the "Storyboarding in an Animated Television Production" award. During the 2005 Pulcinella Awards, the season won the "Best Action/Adventure TV Series" award as well and the general "Best TV Series" award. While fishing in cold waters, Katara and Sokka, two siblings from the Southern Water Tribe, discover a boy trapped inside an iceberg floating on the sea. They free him and learn that the boy is Aang, an Airbender of the Air Nomads. This surprises them, as airbenders were believed to be extinct for 100 years. Aang, along with his flying six-legged sky bison, Appa, returns with Katara and Sokka to their village, where he amuses the villagers with his airbending. Meanwhile, Prince Zuko of the Fire Nation, accompanied by his uncle Iroh, is patrolling the surrounding waters in desperate search of the Avatar, a fabled immensely powerful bender who can bend all four elements, whereas all other benders inherit only the ability to bend a single element. Katara confides in Aang that she is a waterbender and would like to learn more about how to use her abilities, but is hindered by the fact that she is the only waterbender in the Southern Water Tribe. Aang makes a promise to take her to the Northern Water Tribe as a solution. A chance encounter with an abandoned Fire Nation ship reveals that Aang is unaware of the war that has been waging between the Fire Nation and the other three nations of the world for 100 years, a war which began with the apparent annihilation of the Air Nomads. From this they deduce that Aang must have been frozen for at least that long. The pair accidentally set off a signal flare on the ship, alerting Zuko, who already suspects the Avatar is nearby. After bringing Fire Nation attention to the village, Aang is banished, despite Katara's objections. Zuko soon descends on the village and demands the Avatar be surrendered to him. Aang returns to the village to defend it, where he reveals that he is, in fact, the Avatar. He then surrenders himself to Zuko on condition that the villagers are left alone, to which Zuko agrees. Katara and Sokka then decide to pursue Aang on Appa. Aboard Zuko's ship, Aang is at Zuko's mercy, but he eventually manages to break free from the guards and does battle with Zuko in the process. Aang is nearly defeated by Zuko, getting knocked into the water and almost drowning, but he saves himself using waterbending in his "Avatar State", a state in which he taps into all of the bending potential of his past lives from a cycle of reincarnation, allowing him to manifest incredible ability to manipulate the four elements. With the help of Katara and Sokka, Aang escapes from Zuko. As the three ride away on Appa, they set a course for the North Pole so that Aang and Katara can learn waterbending. Aang is eager to return to his home, the Southern Air Temple, despite Katara's warnings that things may have changed in the 100 years since he was last there. Aang shows Katara and Sokka around the now-deserted temple, while reminiscing about his time with his mentor, Monk Gyatso, as Katara tries to hide any traces of the Fire Nation to spare his feelings. The three then enter the air temple sanctuary, where they find statues of every previous Avatar (who are also Aang's past lives), as well as a flying lemur. While chasing the lemur, Aang discovers a room full of Fire Nation helmets surrounding Gyatso's skeleton, and enters the Avatar State in his grief. Once Katara and Sokka calm him down, he comes to the realization that the Fire Nation has killed every airbender except him. As they leave the temple, they adopt the lemur as a pet, and Aang names him Momo. Meanwhile, Zuko stops at a Fire Nation base to make repairs to his ship, where he is greeted by Zhao, a commander in the Fire Nation Army. Zuko tries to hide the fact that he has seen the Avatar, but Zhao discovers the truth and takes on the task of capturing the Avatar himself, deeming Zuko a failure. Zuko refuses to accept this, as capturing the Avatar is the only way he can return from his banishment from the Fire Nation. Tensions rise between the two, so they challenge each other to a firebending duel (known as an agni kai), which Zuko wins, although he spares Zhao. Looking for a short break from their travels, Aang brings the gang to the Earth Kingdom's Kyoshi Island, where he seeks to ride "Elephant Koi," large fish who inhabit the surrounding waters. However, the group are captured by the Kyoshi Warriors, a group of warriors (consisting entirely of girls) who protect the island. But they are freed when Aang proves he is the Avatar, and Aang quickly gains reverence among the island's inhabitants. But his popularity, especially among the girls, soon goes to his head, creating a rift between him and Katara. Meanwhile, Sokka is embarrassed after being bested by girls in combat training, and strives to prove himself stronger than the Kyoshi Warriors. When he suffers further embarrassments, he swallows his pride and respectfully asks to be trained by their leader, Suki, who cheerfully agrees. Aang's desire for popularity soon puts himself and Katara at risk when he tries to ride a Unagi, as well as the whole island when Zuko gets word of his location. Zuko attacks, but Aang, Katara, and Sokka all manage to escape before the entire island is decimated in the Fire Nation attack. The next stop on the group's trip around the world is the Earth Kingdom city of Omashu. There, Aang shows Katara and Sokka the Omashu mail delivery system, a massive stone causeway which he and his friend Bumi (note: a Hindi word meaning 'Earth') had once ridden for fun a hundred years previous. The trio gives the chutes a try but runs into trouble after it destroys a cabbage merchant's cart. Put in front of the king of the city, and elderly and erratic old man of substantial skill and strength in earthbending, the three are unexpectedly given a feast, during which it becomes obvious that the king suspects that Aang is the Avatar. When the king's suspicions are confirmed, he imprisons the three and puts Aang through three deadly challenges to test his skills and earn their freedom, including a duel with the king himself. After Aang passes all of the challenges, he realizes that the king is his old friend Bumi. King Bumi admits as much and reveals that Aang and his friends were never in any real danger but that he felt the need to provide some illustration of the heavy role Aang had to now assume as the Avatar. Aang, Katara, and Sokka camp near a small Earth Kingdom town where they meet a young earthbender named Haru. However, the town is occupied by the Fire Nation, and earthbending is outlawed. Katara convinces Haru to save an old man using earthbending, only to have the same old man turn Haru in. Katara then devises a plan to save Haru by getting herself arrested for earthbending, which she fakes with some help from Aang. When she arrives at the Fire Nation prison, a metal sea fortress that is impervious to earthbending, she finds that all of the prisoners have lost hope due to their inability to bend. But Katara successfully leads a rebellion with Aang and Sokka's help by giving the earthbenders all of the coal on the fortress. The earthbenders all escape and return to their occupied towns with plans to rebel against Fire Nation occupation. Aang finds himself in a small Earth Kingdom village that is being attacked by Hei Bai, a monster from the Spirit World. The village believes that Aang can make peace with the spirit, since the Avatar is said to be the bridge between the Physical and the Spirit World. Aang unsuccessfully tries to calm the monster, which kidnaps Sokka in the process of attacking the village. Aang pursues him, but he is knocked out and ends up in the Spirit World, from which he cannot be seen or heard. While there, he is told that Avatar Roku has a message for him on the Winter Solstice. After returning, Aang proceeds to calm the attacking spirit, restoring peace to the village. Elsewhere, Iroh gets captured by Earth Kingdom soldiers while bathing in a hot spring. The soldiers plan to take him to the Earth Kingdom capital, Ba Sing Se, to face justice, but Iroh proves to be an immensely formidable firebender, even when restrained. Zuko eventually catches up with the soldiers to help free him, forgoing his chase for the Avatar for a time. Aang, Katara, and Sokka travel to the Fire Temple on an island inside Fire Nation waters, so that Aang may receive a message from Avatar Roku before sunset. The three are attacked at a blockade led by Zhao, but they make it through successfully. Zuko also pursues them through the blockade, despite being banished from the Fire Nation. When the three arrive at the temple, they soon discover that the Fire Sages, the servants of the temple, are no longer loyal to the Avatar, but to the Fire Lord, the leader of the Fire Nation. The sages attack, but one proves to still be loyal to the Avatar and leads them to the temple sanctuary. Aang manages to enter the sanctuary after narrowly escaping capture by Zuko and the other sages, who capture Sokka and Katara. Zhao arrives shortly afterwards, intending to apprehend both Zuko and Aang. Avatar Roku appears to Aang and informs him about "Sozin's Comet", which will return in just under a year and give the Fire Nation the power to finish the war with a brutal assault; the comet greatly enhances the power of all firebenders for a short time, and it was with this power that the Fire Nation destroyed the Air Nomads 100 years previous. In order to avoid a repeat of this catastrophe, Aang must master all four elements and defeat the Fire Lord before the return of the comet. Roku's spirit then manifests inside Aang's body, repelling Zhao's forces with a staggering display of bending that destroys the temple as Aang, Katara, Sokka, and Zuko to escape. Aang grows frantic over the fact that he must master all elements to defeat the Fire Lord in less than a year, so Katara begins teaching Aang waterbending, despite her limited training. But waterbending comes naturally for Aang, much to Katara's frustration. Later, while in town to buy supplies, Katara finds a waterbending scroll at a store run by pirates, which she steals. Katara struggles to learn the technique in the scroll, while Aang picks them up quickly, further frustrating Katara. Meanwhile, Zuko runs into the pirates and agrees to help them find Aang and the scroll. They soon find and capture Aang, Katara, and Sokka. But Sokka turns the pirates against Zuko, and the three escape in the ensuing fight, with Aang and Katara using their newly developed waterbending skills. A band of guerrilla fighters, led by the rogue Jet, rescue Aang, Katara, and Sokka from a small group of Fire Nation soldiers. Jet invites the team back to the Freedom Fighters' hideout, where the group plots out its attacks. Jet and Katara form an instant bond, but Sokka has suspicions about Jet, which leads the young rebel to tempt Sokka with missions. His plan fails, however, with Sokka increasingly concerned about Jet's motives and true objectives. Aang and Katara decide to help Jet in his efforts to "save" a nearby Earth Kingdom town, but Jet's real intent is to drown the village, sacrificing the lives of innocent civilians to destroy the Fire Nation garrison there. However, Sokka manages to evacuate the city, Earth and Fire citizens alike, in time to avoid Jet's plot. The next destination the protagonists, now styling themselves "Team Avatar", stumbles into is the Great Divide, the world's largest canyon. The group starts bickering, so Aang decides to put his diplomatic skills to the test, as an Avatar is supposed to be a conciliator and promoter of peace. He successfully solves their minor disputes, but Aang's skills are soon put to a more substantial test when two Earth Kingdom tribes, who have been in a feud for 100 years, are forced by an environmental calamity to cross the canyon together. Aang sends Appa across with the most needy people of the two tribes, and, with the help of a knowledgeable earthbender, guides the rest across the vast, dry landscape. In the end, Aang is able to end the feud, and the two tribes travel together to the famous capital city of the Earth Kingdom, Ba Sing Se. The group is in need of money, so Sokka decides to help out a fisherman who is willing to pay him to help him on his next fishing trip, even though a storm seems imminent. The fisherman recognizes Aang as the Avatar "who turned his back on the world". Aang runs away in guilt, but Katara manages to track him down. Aang reveals to Katara that the monks at the Southern Air Temple wanted to send him away to the Eastern Air Temple to separate him from Monk Gyatso, the only person who Aang felt cared about him as a person, instead of as the Avatar. This led Aang to run away from home and, after getting caught in a terrible storm, eventually seal himself and Appa in the iceberg. Meanwhile, on Zuko's ship, Zuko's crew begins to question his leadership, until Iroh explains that the Prince was scarred, not in a training accident as they were led to believe, but in an agni-kai with his own father. His father had taken offense when Zuko spoke up in a meeting with his generals. When Zuko refused to fight, his father gave him the terrible burns which cover a large portion of his face, and then banished him. Zuko was commanded never to return unless he found and captured the Avatar. When the storm hits, Sokka and the old man nearly drown, but they are rescued by Aang and Katara. Aang is forced to enter the Avatar State, mirroring the events that led to him being trapped in the iceberg for a hundred years, but this time he is able to escape alone with the old man, Sokka, and Katara. Zuko also acts heroically when his ship is struck by lightning. A member of his crew becomes trapped on the bridge, and Zuko is able to rescue the crewman with the help of the lieutenant Iroh had educated earlier. Iroh also uses his bending to redirect lightning away from the ship, an incredibly rare and advanced form of firebending technique. Zuko then sees Aang flying away on Appa, but elects not to pursue them in order to get his crew to safety. Sokka suffers from an illness due to his exposure to the elements during the storm. When Katara begins to contract the illness as well, Aang goes to a nearby herbalist institute in hopes of finding a cure for his friends. On his way to collect the remedy the herbalist recommends (frozen frogs the afflicted are to stick in their mouths), Aang is kidnapped by a group of Fire Nation Yuu Yan archers, commanded by the newly promoted Admiral Zhao. However, a masked marauder rescues Aang from Zhao. The "Blue Spirit" is knocked unconscious during the escape, and Aang discovers that he is Prince Zuko. Aang offers him friendship, but departs when he is violently rebuffed. Katara, Aang, and Sokka go into a village that relies solely on the predictions of a fortuneteller, Aunt Wu. Sokka is skeptical and refuses to believe anything the fortuneteller says, and tries to disprove all the predictions she makes. Katara, on the other hand, is obsessed, and keeps returning to the fortuneteller for more predictions on her love life. Aang, who has become smitten with Katara, attempts to attract her attention throughout, with limited success; eventually he attempts to fetch a rare flower from the lip of a nearby volcano, which is revealed to be on the verge of erupting — a direct contradiction to Aunt Wu's predictions. Katara and Aang use waterbending to manipulate the clouds as a warning to the villagers, and the group manages to evacuate the village before the volcano erupts. As the lava comes toward the town, Aang pushes it back with strong airbending, causing Sokka to comment that Aang is a "powerful bender". This catches Katara's attention, as Aunt Wu had earlier predicted that she would marry a "powerful bender". Sokka, Aang, and Katara find a seemingly abandoned Water Tribe fleet ship. Camping out by the boat, Sokka and Katara are overjoyed when they are soon joined by Bato, an old friend of Katara and Sokka's father, Hakoda, and a fellow member of the Southern Water Tribe. While they reminisce about the old days, Aang feels left out; when a messenger arrives with a message from Hakoda, with instructions to find him, Aang intercepts it and keeps it to himself, fearing they will abandon him. Later he comes clean about the message, but Sokka, furious at Aang for keeping it from them, is insistent on leaving to find his father. Meanwhile, Zuko finds a bounty hunter, June, to help him track down the Avatar, utilizing a large reptilian mount with a powerful sense of smell. This leads to a skirmish, with Katara and Sokka returning to rescue Aang and resume their collective journey to the North Pole. Team Avatar travel into a Fire Nation town, which is hosting a festival of Fire Nation culture. Unfortunately, Aang's identity is discovered, but a strange man, Chey, helps the gang escape. Chey tells the trio about "the deserter", a man named Jeong Jeong who is the first man to desert the Fire Nation army and live. More importantly, he is a powerful firebending master who is not allied with the Fire Nation. However, Jeong Jeong initially refuses to teach Aang because he is still haunted by his failure to teach self-control to a previous student. It is only when Avatar Roku intervenes that Jeong Jeong consents to teach Aang. Aang, unfortunately, demonstrates difficulties with the hard discipline required for safe firebending, and accidentally burns Katara. This leads Katara to the realization that she can use her waterbending to heal, but Aang nevertheless comes to regard firebending as dangerous and vows never to firebend again. Meanwhile, Aang is tracked down by Admiral Zhao, who is revealed to be Jeong Jeong's undisciplined former student. He fights Aang, but Aang is able to escape him by using Zhao’s lack of self-control against him and causes Zhao to burn his own ship. A storyteller tells the gang of a group of people who travel in the air. According to the story, these people reside at the Northern Air Temple. The group decides to check it out, but are disappointed to learn that the "flying" people are not air nomads, but just a people who have learned how to use gliders on the strong air currents around the temple. Aang is saddened that the Northern Air Temple has changed so dramatically since the time when he visited over 100 years ago, as its current residents have remodeled it extensively, often knocking through walls and ornate Air Nomad architecture to accommodate steam pipes which propel their rudimentary experiments with steam pressure. Teo, a young paraplegic, convinces Aang to open the one remaining area of the temple left untouched. Aang is shocked to see the "untouched" room is in fact stocked with dozens of inventions with Fire Nation insignias on them. The Mechanist, Teo's father, and a skilled engineer and inventor, confesses to aiding the Fire Nation by building weapons in exchange for the safety of his son and his people. When the Fire Nation comes to collect their latest invention, Aang tells them to leave. The Fire Nation proceeds to launch an attack against the temple, but Aang and the villagers manage to successfully defend against the attack. The Fire Nation, however, does manage to recover the Mechanist's newest invention, a war balloon. After the journey to the Northern Air Temple, the group lurks around the waters surrounding the North Pole, seeking out the Northern Water Tribe. They are found by a group of waterbenders from the tribe, who show them the way. Upon arriving, the gang is welcomed warmly by the citizens of the Northern Water Tribe, and the chief of the tribe throws a huge feast in celebration. Sokka meets Yue, an attractive princess whom he falls for. Aang and Katara seek to learn waterbending from a master named Pakku, but he refuses to teach Katara due to ridiculous customs; women in the Northern Water Tribe are only trained to use their waterbending for healing, with martial training reserved for men. Katara refuses to be bound by the custom and challenges Pakku to a duel, demonstrating her considerable skill and potential. Taking notice of Katara's pendant, given to her by her mother, Pakku realizes that Katara is the granddaughter of his ex-fiance, who could also could not tolerate the Northern Water Tribe's customs and had left to start in a life with the Southern Tribe. Warmed by the memory of his former fiance and the news that she still lives, and impressed with Katara's fighting skills, Pakku relents and agrees to train her. Meanwhile, Admiral Zhao hires the pirates from "The Waterbending Scroll" to assassinate Zuko. Iroh helps Zuko fake his death and then feigns obsequious loyalty to Zhao, and sells his skills as a bender for an attack on the North Pole. With Iroh's help, Zuko sneaks aboard Zhao's lead ship as his fleet departs. As the Fire Nation's forces close in on the Northern Water Tribe, the leaders and citizens scramble to find a way to defend against the armada. As night begins to fall, Admiral Zhao decides to heed Iroh's advice and halt the attack since waterbenders are stronger under the moonlight. Zuko leaves Zhao's ship and infiltrates the tribe on his own, seeking to capture Aang. Aang believes going into the spirit world and speaking to the moon and ocean spirits could give him the wisdom to defeat the Fire Nation. However, after Aang's spirit leaves for the spirit world, Zuko arrives to kidnap his body; despite stern resistance from Katara, he succeeds when dawn breaks and the Fire Nation, stronger in sunlight, begins its attack. Zuko struggles to find shelter in the freezing temperatures of the North Pole, while Sokka, Katara and Yue search for him and Aang. At the fortress of the Northern Water Tribe, firebenders and Fire Nation tanks manage to infiltrate the city. When Aang returns from the Spirit World, Sokka, Katara, and Yue are able to follow his spirit to his body. Admiral Zhao slays the moon spirit, Tui, in spite of warnings from both Aang and Iroh, who explain that the whole world depends on the moon. Without the moon the waterbenders lose their ability to waterbend. Aang goes into the Avatar State and, in joining with the Ocean Spirit La, decimates the Fire Nation armada, with the exception of Iroh and Zuko and driving the damaged surviving ships back into the sea with massive tidal waves. Zuko finds and fights Zhao, and Iroh remains with Team Avatar to try to revive Tui. He recognizes that Yue was touched by the moon spirit as a baby, thus explaining her unique white hair, and Yue gives back that spark of life that the spirit gave to her, sacrificing herself to save the Moon Spirit after sharing a final kiss with Sokka. Zhao is pulled underwater by the Ocean Spirit in retaliation for slaying the Moon Spirit, refusing to accept Zuko's help when he attempts to save him. At the end of the episode, Fire Lord Ozai, Zuko's father, assigns Zuko's sister, Azula, a mission: to hunt down her traitorous uncle and brother. Nickelodeon started releasing Season One DVDs in North America on January 31, 2006 with a series of single-disc sets containing four episodes per disc. Later the Complete Book 1 Collection was released on September 12, 2006 containing all twenty episodes plus extras on six discs. PAL versions of the single-disc volume sets started being released on February 19, 2007;. As with the original Region 1 NTSC DVDs, each set contains four episodes per disc. The Complete Book One Collection was released on January 26, 2009 containing all twenty episodes on five discs. These Region 2 releases lack the commentary tracks and other DVD extras found on the Region 1 releases. The Last Airbender is a live action film based on the first season of the animated television series and had a theatrical release on July 1, 2010. The film was directed by M. Night Shyamalan. 1.^ Production code format taken from the commentary for "Sozin's Comet: The Phoenix King"
^ a b "Avatar Sneak Peak". Nickelodeon. Archived from the original on October 18, 2007. Retrieved May 29, 2008. ^ a b Mell, Tory Ireland (May 27, 2008). "The Siege of the North — Part 2 Review". IGN Entertainment. Archived from the original on 23 February 2009. Retrieved February 26, 2009. ^ a b c d e f g Fries, Laura (February 21, 2005). "Avatar: The Last Airbender Review". Variety TV. Reed-Elsevier Inc. Archived from the original on April 18, 2008. Retrieved May 30, 2008. ^ a b Ryan Ball (May 3, 2005). "Cartoons on the Bay Picks Winners". Animation Magazine. Animation Magazine. Archived from the original on 11 December 2007. Retrieved December 8, 2007. ^ "Avatar: The Last Airbender — The Complete Book 1 DVD Information". TVShowsOnDvd.com. Archived from the original on 2 October 2008. Retrieved September 6, 2008. ^ a b c d "Avatar — The Legend of Aang — Book 1 - Water Vol.1". Amazon.com, Inc. Archived from the original on June 29, 2011. Retrieved May 30, 2008. ^ a b McClintock, Pamela; Gabriel Snyder (January 8, 2007). "Shyamalan's 'Avatar' also to bigscreen". Variety.com. Archived from the original on April 10, 2008. Retrieved June 29, 2008. ^ a b Fernandez, Jay A. (March 15, 2009). "Four more land 'Airbender' roles". The Hollywood Reporter. Archived from the original on April 5, 2009. Retrieved April 3, 2009. ^ a b c DiMartino, Michael Dante; Konietzko, Bryan (August 29, 2005). "Interview with "Avatar" Program Creators — Page 3". Animation Insider (Interview: Transcript). Interviewed by Aaron H. Bynum. Archived from the original on December 16, 2012. Retrieved May 29, 2008. ^ a b c d "Avatar: The Last Airbender". Hollywood.com. Hollywood Media Corporation. Archived from the original on 15 April 2008. Retrieved May 30, 2008. ^ DiMartino, Michael Dante; Konietzko, Bryan (August 29, 2005). "Interview with "Avatar" Program Creators — Page 4". Animation Insider (Interview: Transcript). Interviewed by Aaron H. Bynum. Archived from the original on 27 May 2011. Retrieved December 12, 2013. ^ "Avatar: The Last Airbender (2005–2008) Company Credits". Archived from the original on 2016-09-30. ^ a b Rich, Jamie S. (September 27, 2006). "Avatar: The Last Airbender — The Complete Book 1 Collection". DVDTalk.com. Archived from the original on May 7, 2009. Retrieved May 4, 2008. ^ Director: Dave Filoni; Writer: Aaron Ehasz (December 2, 2005). "The Siege of the North, Part II". Avatar: The Last Airbender. Season 1. Episode 20. Nickelodeon. ^ Director: Lauren MacMullan; Writer: Michael Dante DiMartino (February 25, 2005). "The Southern Air Temple". Avatar: The Last Airbender. Season 1. Episode 3. Nickelodeon. ^ Director: Dave Filoni; Writer: James Eagan (May 6, 2005). "Jet". Avatar: The Last Airbender. Season 1. Episode 10. Nickelodeon. ^ Lacey, Gord (March 25, 2006). "Avatar: The Last Airbender — Book 1: Water, Volume 2 Review". TVShowsOnDVD.com. Archived from the original on 20 April 2008. Retrieved May 4, 2008. ^ Urban, Christina. "Avatar The Last Airbender — The Complete Book 1 Collection; Editorial Reviews". Barnes & Noble. Archived from the original on September 19, 2008. Retrieved August 6, 2008. ^ Aaron H. Bynum (June 30, 2006). "Avatar: Season 3". Animation Insider. Archived from the original on November 5, 2012. Retrieved December 16, 2006. ^ "Annie Awards: Legacy - 33rd Annual Annie Awards". International Animated Film Society. February 9, 2005. Archived from the original on 17 May 2008. Retrieved April 26, 2008. ^ a b "Avatar — The Legend of Aang — Book 1 - Water Vol.2". Amazon.com, Inc. Archived from the original on June 29, 2011. Retrieved May 30, 2008. ^ a b "Avatar — The Legend of Aang — Book 1 - Water Vol.3". Amazon.com, Inc. Archived from the original on June 29, 2011. Retrieved May 30, 2008. ^ a b "Avatar — The Legend of Aang — Book 1 - Water Vol.4". Amazon.com, Inc. Archived from the original on June 29, 2011. Retrieved May 30, 2008. ^ a b "Avatar — The Legend of Aang — Book 1 - Water Vol.5". Amazon.com, Inc. Archived from the original on June 29, 2011. Retrieved May 30, 2008. ^ "Avatar — The Last Airbender: The Complete Book 1 - Water — Collection (vol. 1-5)". Amazon.com, Inc. Archived from the original on June 29, 2011. Retrieved May 30, 2008. ^ a b c d e f "Avatar: The Last Airbender on DVD". TVShowsOnDVD.com. February 24, 2005. Archived from the original on 17 October 2008. Retrieved October 28, 2008. ^ "Avatar - The Last Airbender: Book 1 - Water: Volume 1". EzyDVD. Archived from the original on August 28, 2009. Retrieved June 20, 2009. ^ "Avatar - The Legend of Aang: Book 1 - Water: Volume 5". EzyDVD. Archived from the original on March 16, 2009. Retrieved June 20, 2009. ^ a b "Avatar: The Last Airbender — Season One DVD Information". TVShowsOnDVD.com. Archived from the original on 4 November 2008. Retrieved October 28, 2008. ^ "DVD: Avatar: Book 1 Water: Volume 1/2/3/4/5: 5dvd (2009)". hmv.com. Archived from the original on September 28, 2012. Retrieved February 1, 2009. ^ "Avatar - The Legend of Aang: The Complete Book 1 Collection (5 Disc Box Set)". EzyDVD. Archived from the original on 9 May 2009. Retrieved June 20, 2009.